I arrange and produce music. ReaPack is a decentralized package manager for REAPER resources. A redirector and ad blocker for the Squid HTTP proxy configurable in Ruby. A text-based presentation software with its own interpreted language. My old website where I transcribed various songs by ear for fun from 2014 to 2015. 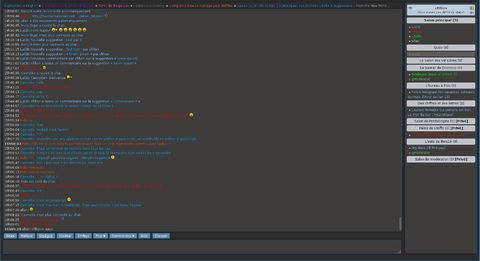 This chat room webservice is one of my first programming project. A WYSIWYG presentation software which was later superseded by SlideField. A few plugins I wrote back in 2012 for the MyBB forum software.